wool dyed in hibiscus tea. My bubbly friend Tiffany oozes talent and quirky imagination. I'm jealous. Self-taught artist Tiffany O'Brien was born and raised in Winston-Salem and learned a lot from her dad. These days, you can find her in SOHO, NYC. Her work celebrates the fringe carnival culture of "Freaks, Geeks & Beauties", as her blog and Etsy shop are titled. Tiffany loves Coney Island and visits there often for inspiration. She and her husband took me there for my first Coney Island visit, where I saw the Wonder Wheel, built in 1918, and rode the Cyclone. Built in 1927, it's one of America's oldest wooden roller coasters still in operation. Then we dropped in to Ruby's for a drink and to see the crowds dance and watch the fireworks. insisted I ride in the front seat for my maiden voyage. 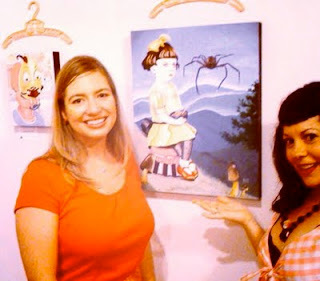 Tiffany's work celebrating the fringe carnival culture has been referred to as outsider art and pop surrealism. She has exhibited her work in Winston-Salem, NYC, Atlanta and as far as Quebec. 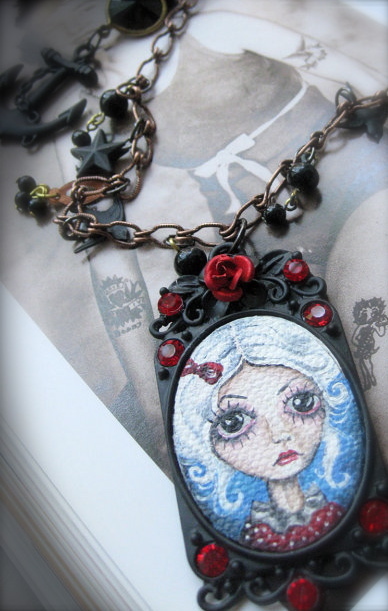 Primarily a painter, her latest adventure in art is jewelry making. 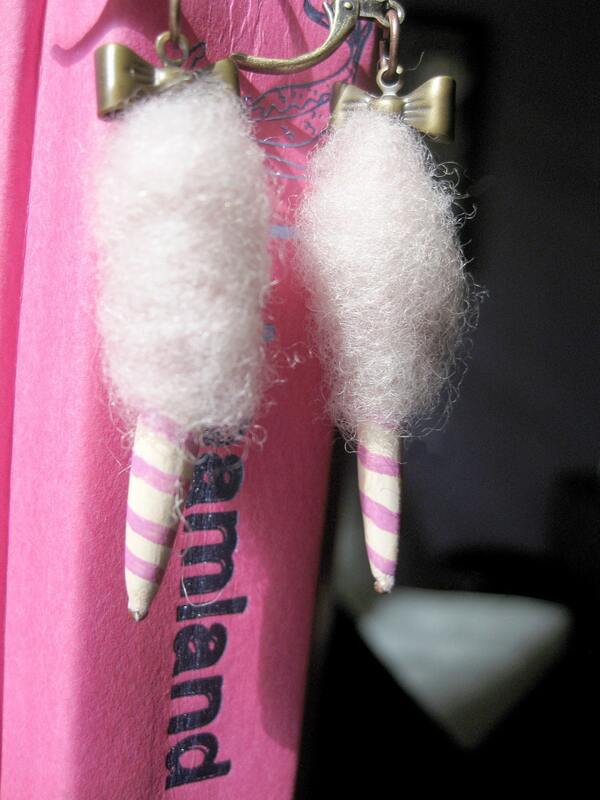 These pink cotton candy earrings can be found locally at Urban Artware (beside 6th & Vine) in Downtown Winston-Salem along with several other pieces, like the "Tattoo Maker" below, one in her series, "The Butcher, The Baker, The Tattoo Maker." Currently, you can see more of her jewelry paintings by visiting Urban Artware (the actual gallery) at 207 W. 6th St., Winston-Salem, NC. 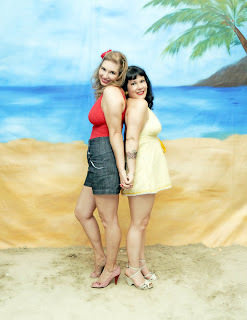 Her Etsy shop Freaks Geek & Beauties; and for more insights and great photography, her blog: Freaks, Geeks & Beauties. This off-center Hipstamatic pic doesn't do justice to Tiffany or "Little Miss Muffett"
from her nursery rhyme series, which is now proudly displayed on my wall. shoots on my visit to NYC last year. Awwwwe! That's me! Thanks for the "Blog Out", you know like a shout out. I still have a pair of cotton candy earrings for you girl.